“A certain man was preparing a great banquet and invited many guests. At the time of the banquet he sent his servant to tell those who had been invited, ‘Come, for everything is now ready.’ But they all alike began to make excuses. The parable is introduced in the context of someone making a statement about the kingdom of God. So we can take it that the original audience and readers would have understood the parable to be about that. Then it is not unreasonable to assume that the “certain man” Jesus introduces is God who has prepared a feast for His people. The point first century readers would have picked up is that those he first invited – the Jews – refused to come to what he had prepared and so he invited the Gentiles, the spiritually (and materially) poor, crippled, blind and lame who are outside the house to come instead. The context in which Jesus spoke brings home the point for his audience at the time of his telling of this parable. Jesus is at the house of a rich Pharisee (v1) who, no doubt, would have invited his – equally rich – friends to dinner on many occasions. This time, for whatever reason, he has invited Jesus along with them – there is no mention of any of His disciples or followers being invited. It is not clear how the man with dropsy got in, perhaps he was one of the Pharisee’s old servants, but the attitude of the Pharisee and his friends before and after the man is healed does not impress Jesus (v2-6). Neither does the guests approach to the table (v.7 – 11). Jesus then challenges the Pharisee to not just invite his relatives and rich neighbours to meals like this one but also the poor, crippled, lame and blind (v12-14). Jesus then explains in this context that God has invited some people to a feast. Jesus gets the Pharisee, and his guests, to imagine what it would be like if, after all the preparations, all his friends began to make excuses not to come – some of them quite lame. Jesus knows what God will do, He will invite others to come in their place. Actually He will go out and make them come in. And they won’t be healthy and rich like the Pharisee’s friends, they will be poor, crippled, lame and blind like the man with the dropsy. With all that context, the message must have come home loud and clear to the Pharisee and his guests: you may have invited Jesus to your house but unless you understand His heart towards the poor and outsiders you are in danger of taking His far more important invitation to the Kingdom of God too lightly and missing out. 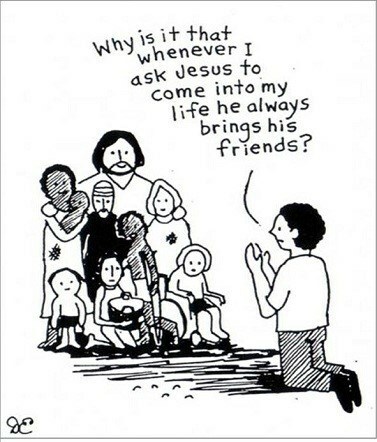 We often use the phrase “I invited Jesus into my heart”. However this parable makes it clear that if you have invited Jesus in to the house of your soul you can expect Him to bring a lot of others with Him. He kept some strange company of outcasts, poor, lame and crippled. He is not impressed by how clean, tidy and well-ordered your house may be, or how well off you are, he will still bring them with Him. We need to be open to the company that Jesus keeps. ‘Inviting jesus into your heart’ or similar evangelical phrases is foriegn to the Bible but ‘The Kingdom of God’ is of course not and the feasters would know what they meant by that even though there is not much clarity among Christians today about what, where and when that may be. There is however quite a bit about the attitudes, lifestyle and expressions of care and love that would qualify for a place in that Kingdom and you are right that the challenge of Jesus to the religious in positions of prominance is as applicable today as it was when he spoke these words as indeed it is for all of us.